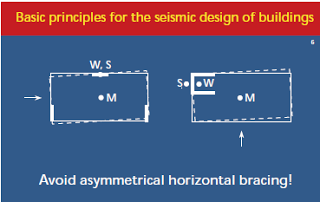 Civil Engineering: Basic principle for the Seismic design of building: Avoid asymmetric bracing! 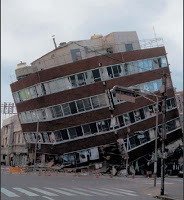 Basic principle for the Seismic design of building: Avoid asymmetric bracing! Asymmetric bracing is a frequent cause of building collapses during earthquakes. Column should also be able to withstand horizontal displacements of the structure without loosing load bearing capacity. In this sketch only lateral bracing element (walls and trusses) are represented. The column are not drawn because their frame action to resist horizontal forces and displacements is small. In above sketch M- center of mass, W- center of resistant for horizontal forces, S - center of stiffness. W is the center of gravity of the flexural and frame resistance of structural elements along the two major axes. If the center of resistance and the center of mass do not coincide, eccentricity and twisting occur. The building twists in the horizontal plane about the center of stiffness. In particular, this torsion generates significant relative displacements between the top and bottom of the column furthest away from the center of stiffness and these often fail rapidly. Therefore the center of resistance should coincide with , or be close to, the center of mass, and sufficient torsional resistance should be available. This can be achieved by symmetrical arrangement of the lateral bracing elements.These should be placed, along the edges of building, or in any case sufficiently far away from the center of mass. In this building with flat slabs and small structural columns designed to carry gravity loads, the only bracing against horizontal forces and displacements is a reinforced concrete elevator and stairway shaft, placed very asymmetrically at the corner of the building. Which result in large eccentricity between center of mass and resistance or stiffness. Twisting in the plan will lead to large relative displacements in the columns furthest away from the shaft and the danger of punching shear failure.